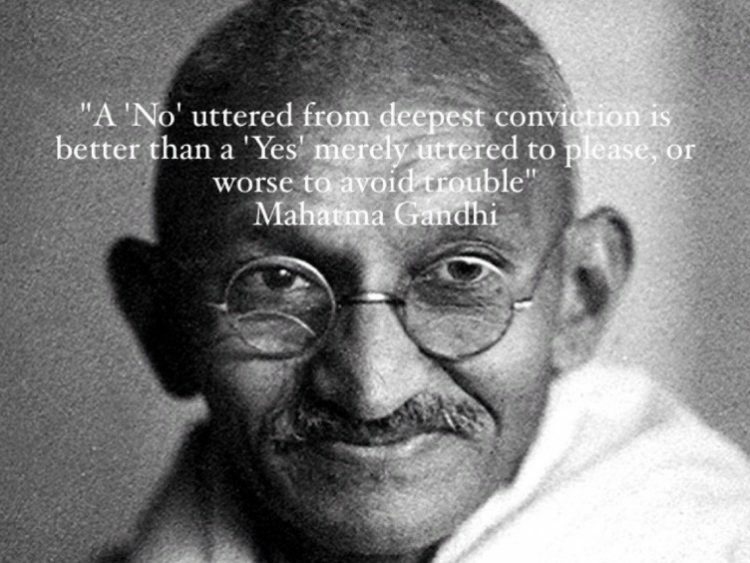 Anti-War activist and independence leader Mahatma Gandhi knew how to say no. He was a master of simple living. You could say he created the “less is more” movement decades before it gained any prominence. He worn plain clothes, enjoyed simple vegetarian food, and lived in a modest community. Educated as an attorney he easily could have lived an abundant lifestyle filled with every imaginable luxury. Instead he chose another path. That path required a mastery of the word no. He said “a ‘no’ uttered from deepest conviction is better than a ‘yes’ merely uttered to please, or worse, to avoid trouble”. Wow! When this guy said yes you knew he meant it. How often do you say yes when you really preferred to say no? What did those times of saying yes cost you in wasted energy, money, time or mental anguish? In a world desperately needing authenticity we all need to strive to be true to ourselves. As Eleanor Roosevelt once said “Do what you feel in your heart to be right – for you’ll be criticized anyway”. So true.